Best Weight Loss Books ! Best Weight Loss Books for You! What are the best weight loss books for you? First you have to start with a good diet book. The book has to describe a diet that works, not a diet that is just fun or popular. Most people that read a diet book do not actually try the diet and then stay with it for an extended time. When you read the reviews, the good reviews may be from someone who enjoyed the book, or found the book easy or fun. All effective weight loss books are based on fewer calories being absorbed than being used by the body. Even though it may be effective, I will not consider books that encourage throwing up or diarrhea as the solution. I will only consider diet books that encourage healthy eating habits. In the past as I finished reading a book that I did not feel worthy of a review, I did nothing. Now I have a page of not the best weight loss books. This was a really fun book to read. Do not get me wrong, I do not want to gain 75 pounds in 6 months on purpose like the author, but I did find it amazing how fast I could gain weight if I tried. The rapidity with which Drew gained weight also serves as a lesson to me to make sure that I try to be healthier when I am not on a diet. So, I know that you are wondering: How did he lose the weight in 6 months? I hate to disappoint you, but mostly he cut back on his calories. Only later did he start back to exercising. The book did offer a few good really simple recipes including his recipe for Spinach Shake which he had every morning for breakfast when he was losing weight. He also had pictures of a few of his favorite exercises which I found helpful. I mostly suggest this book for its fun read and motivation. What a great book. This is not a weight loss plan per say, but it gives so much information on the biology and biochemistry of weight loss. It ties in all the major organs of the body and tell you what roles the pituitary gland, the liver, the small intestines, the thyroid and stomach etc play in the battle of losing weight. This book puts a lot of emphasis on the importance of eating healthy and being healthy so as not to stress the body which signals the body to defend itself by putting on weight. I highly recommend this book as being part of your weight loss library. 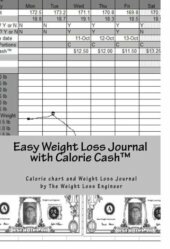 This is an easy to use weight loss journal and an easy to use calorie chart. This book is not only easy to use but it is also fun, if limiting calories and dieting could ever be thought of as fun. The Weight Loss is so easy because you just need to answer Y or N to a few simple questions each day. The Calorie Chart is easy because it uses shading to suggest which foods to eat. The darker the shading the worse the food is going to be for you while you are on a diet trying to lose weight. Calorie Cash™ is an easy way to keep up with how many calories you have eaten each day. All calories are rounded off to the nearest 25 which equates to 25 cents. A Calorie dollar is about 100 calories. You use play money to keep up with how much calorie cash™ you have spent that day. When you run out of calorie cash™ it is time to quit eating. Oh! Did I mention that I wrote this book. Please check it out. Read more about calorie cash™. I have not tried this diet yet, but I plan to start it for my traditional New Years Resolution Diet. In many ways it reminds me of the Atkins diet, but it does not allow you to eat fatty meats, and it adds some fiber, and it emphazizes vegetables after the Attack Phase (Dunkan Diet Phase 1). I do not know about you, but I lost weight during the first couple of weeks that I was on the Atkins Diet, but then I started to slowly gain the weight back. I think that part of the problem may have been that Atkins at the time did not restrict you from eating fatty meat. That fat may have been what was putting the weight back on me. To sum it up, I like this book. I learned a lot. With 4 phases it takes you from the extreme to a more healthy sustainable way of eating. Why not get started by reading more about The Dukan Diet Phase 1. Simple food plans based on five food groups is the best way to describe this diet. I have not put the ideas in this book to the test yet, but it seems that it is based on good nutritional ideas. I particularly liked what she had to say about how to stop emotional eating. I knew this had to be a good book when I saw that cynthia was a coauthor of "Flat Belly Diet", and a contributing editor of Shape. This was an eye opening diet and health book that I read years ago. The things that I read have really stuck with me. As time goes on what I learned in this book seems more and more important. Whether you are overweight or not, everyone should read this book. I have not read this the new version yet, but the original was great so expect this book to be even better. The quick reference to the glycemic Index is by itself worth the price. I enjoyed it and found it useful and had good advice. It is always better to eat real food and to eat fresh food. To paraphrase Michael: If your grandmother would not have recognized it as food, you are better off not eating it.
" I can personally sum up the 17 Day Diet in two words: fast results. If you have diabetes or pre diabetes, get this book. It is not really a diet book, but rather a guide to eating healthy combined with recipes to make eating healthy a pleasure. This book is a bit like the series “Eat This Not This.” The previous book, “Picture Perfect Weight Loss” was on the New York Times Bestsellers list so you know it is good. This book tends to push foods that are naturally high in fiber and Phytonutrients. It encourages one to eat soy protein, and small amounts or healthy fats. This book tells you how to change for life so that you can live the life you want. It is the kind of diet book that talks about motivation. Bob Greene starts off by describing the major road blocks to weight loss then he goes about giving you a plan to either destroy or go around those road blocks. Bob aleready has many great best selling get fit and weight loss books. This is not a good diet book, but it is great for those who are into competitive sports. This book is dense and one can learn a lot. It talks a good bit about “periodization.” It is a way of having rest days, strength days, or aerobic days… Each day is also supported by a different diet. What are the Best Calorie Counter Chart Books? The newest book is one that I am really exited about. The book is : "The Body Fat Solution" by Tom Veneto I have not read it yet but if it is any thing like his ebook "burn the Fat Feed the Muscle" it is a great book I lost weight and built some muscle while using his advice. It also gives some bacic healthy advice. I put it under the tradition books link because the ebook has been out for so long and it is now concidered a classic on the web. It is a great book. Read it when I went to Miami. Why should I tell you about it this guy does a great job. If you want to learn more about his ebook: Click Here! Lossing Weight can actualy be a bit fun. Everytime I try a new diet, I learn about different micronutrients, I learn more about psychology, and I get some new recipes. Knowing the food is better for you actualy makes it taste better too. I have gotten where I really hate parties that are nothing but eating a bunch of cheap birthday cake. I wish I knew of a better tradition. i guess I will just have to keep on reading and learning. It is my belief that most all of the diet plans will work, if you follow through. I hope you will learn to enjoy the strggle as much as I do. When you are winning it gives you a real scence of control over you life. Please e-mail me about new books that you enjoy.